Would you evaluate the candidate drug efficacy by following companion biomarkers related to glomerulonephritis and the drug itself in fine histological kidney regions such as glomeruli? Is there a biomarker associated with kidney small substructures (tubules, ducts…), kidney dysfunction (inflammation, necrosis…) due to a disease, stress or drug toxicity? in the kidney al diseases and with precise localizaey substructures will be illustrated. rat were removed; snap frozen and stored at -80°C. Sectioning: Kidneys were sectioned following transversal plan (10 microns of thickness) using Microm HM560 cryostat (Thermo Scientific, Germany) at -20°C and mounted on ITO conductive glass slides (Delta Technology USA). Matrix: 9AA (9-Aminoacridine) powder (100 mg) was used and vaporized on tissue sample using home-built sublimation apparatus (200°C, 12 min, 2.10-3 mbar). Mass Spectrometry Imaging: Solarix 7.0T FTICR (Bruker Daltonik, Germany) with SmartBeam II laser. Positive mode (600-1800 Da) at 60 μm spatial resolution. 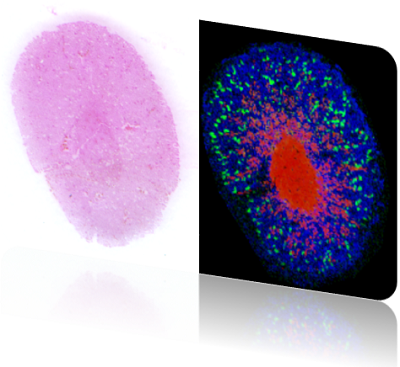 Software: FlexImaging 4.0 (Bruker Daltonik, Germany) & Quantinetix 1.4 (ImaBiotech, France). The above figure shows the distribution of eight lipids, related to defined lipid classes, such as phosphatidic acid (PA), phosphatidylglycerol (PG), phosphatidylethanolamine (PE), phosphatidylserine (PS), phosphatidylinositol (PI), sulfatides (ST), gangliosides (GL) and cardiolipins (CL). The negative detection mode allows observing specific lipid species, but the combination of both polarities give access to other classes, such as phosphatydilcholine (PC), ceramide (Cer) or sphingomyelin (SM). Each lipid has a specific distribution in the histological structures of the kidney, especially in the cortex and the inner/outer medulla as shown on H&E staining. For example, PI (38:4) has a homogenous distribution in the cortex and the outer medulla region. From this kind of lipid profiles in tissue, it would be possible to study and characterize their lipid metabolism in animal disease models (e.g. diabetic versus wild-type model) by following: 1) specific up/down regulation: 2) the modulation of the fatty acid chain length or 3) the degree of saturation of the fatty acid residues. Sulfatides (ST) have a role in myelin function and stability . Dysfunction of ST homeostasis may be involved in kidney disorders . For instance, ST levels are increased in human renal cell carcinoma and altered in a mouse model of polycystic kidney disease. It has been demonstrated that ST are up regulated in cancerous tissue and therefore be considered as an interesting oncometabolite. Variations in ST levels could also be associated with cardiovascular defects induced by renal failure and with kidney dysfunction due to protein overload nephropathy. As we can see on the above figure, ST (32:1) is primarily concentrated in the whole medulla with a higher intensity in the inner medulla region. as presented in the above figure. Gangliosides (GL) are molecules composed of a glycosphingolipid (ceramide and oligosaccharide) with one or more sialic acids (e.g. n-acetylneuraminic acid, NANA) linked on the sugar residue. GL are considered as biomarkers in numerous diseases targeting especially the brain such as Tay-Sachs, Gaucher or Sandhoff diseases. In these diseases, GL levels increase because of alteration or degradation of enzyme function . One therapy could be to repair the enzymatic function . NANA-Gal-Glc-ceramide abbreviated as GM3 (G for ganglioside, M for monosialic acid with only two sugar moieties) is detected in kidney section using MSI. As presented in the insert of the figure, GM3 related species are highly co-localized with glomeruli, which are a network of capillaries that performs the first step of blood filtering. Some dysfunction of glomeruli properties may induce renal pathology such as glomerulo- nephritis or sclerosis . Three forms of GM3 species have been detected in glomeruli with specific fatty acid chain lengths (18:0, 20:0 and 22:0). All these chemical structures have been confirmed by MS/MS measurement and by high mass accuracy measurement (below ppm level). High spatial resolution MSI allows the detection and quantification of a wide range of lipids in specific histological kidney substructures unlike classical LC-MS. Some of the histological related lipids observed using MSI, such as gangliosides (glomeruli), cardiolipins (cortex) or sulfatides (medulla) are considered as reliable biomarkers of disease state. They permit the evaluation of the efficiency or the potential toxicity of a treatment. The detection of theses markers within tissue section, in combination with the precise distribution of the drug candidate in these different kidney substructures provides huge amount of information in support of PK/PD studies. ImaBiotech is proud to announce the certification to the ISO 9001: 2015 quality management.